At long last, we have our first official look at Zombieland 2. Sony has been dancing around with the idea of continuing the horror comedy franchise, which initially debuted in 2009. In the years since, there has been a great deal of talk, but little has come of it. Until now, that is. The studio has shared the first poster for the movie, which reveals the returning cast members a decade into the zombie apocalypse, in addition to revealing what seems to be the official title. 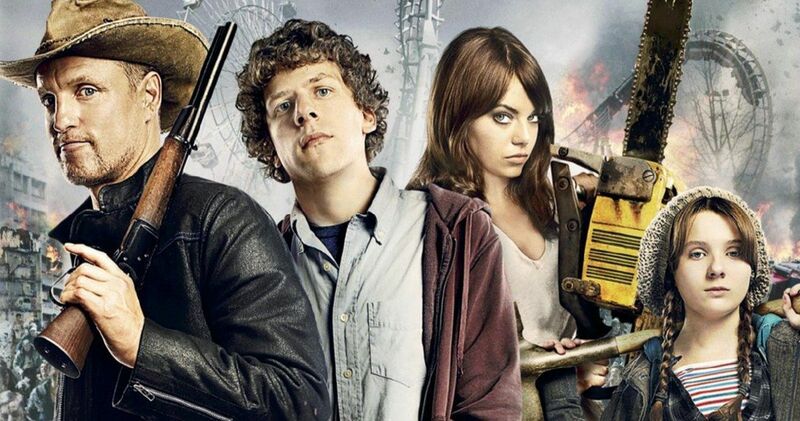 Shared via the official Zombieland Twitter account, which hasn’t posted anything in nearly three years, the photo is a side-by-side with the original theatrical poster, done in the exact same style, featuring the core cast now vs then. It’s a play on the recent viral #10YearChallenge. We see Tallahassee (Woody Harrelson), Columbus (Jesse Eisenberg), Wichita (Emma Stone) and Little Rock (Abigail Breslin). Most of the cast looks very similar, minor differences aside, However, Breslin has grown up a lot and the post-apocalyptic wasteland has hardened them all quite a bit. The image was shared with the following caption. The poster also comes with the familiar phrase “Double Tap” under the title, implying that the official title will be Zombieland: Double Tap. In any event, even if it’s just a tagline, this is all good news for people who have been impatiently awaiting the arrival of this sequel. Production is set to begin this week under the direction of Ruben Fleischer, who helmed the original. Fleischer is coming fresh off of the massive financial success of Venom, which was one of the highest-grossing movies of 2018. Rhett Reese and Paul Wernick, who penned the original, also returned to write the screenplay. In the years since the original’s release, Reese and Wernick have gone on to become highly sought after talents in the industry, having penned both Deadpool movies, in addition to the sci-fi/thriller Life and Michael Bay’s upcoming 6 Underground. They’ve also been set to pen Disney’s Pirates of the Caribbean reboot. New cast members include Zoey Deutch (Set It Up) and Avan Jogia (Ghost Wars), alongside the recently announced Rosario Dawson (Daredevil, Luke Cage). There are also rumors that Bill Murray will once again return following his memorable cameo in the first movie. Only this time, he may be bringing along fellow Ghostbusters star Dan Aykroyd. Zombieland was a success at the box office, bringing in $102 million worldwide and was met with generally favorable reviews. The sequel has proved to be difficult to get going, as the core cast has remained very busy. At one point, Amazon ordered a pilot for a TV show based on the movie, but it wasn’t picked up to series. Zombieland 2 is set to arrive in theaters on October 11. Be sure to check out the new poster from the Zombieland Twitter account below.